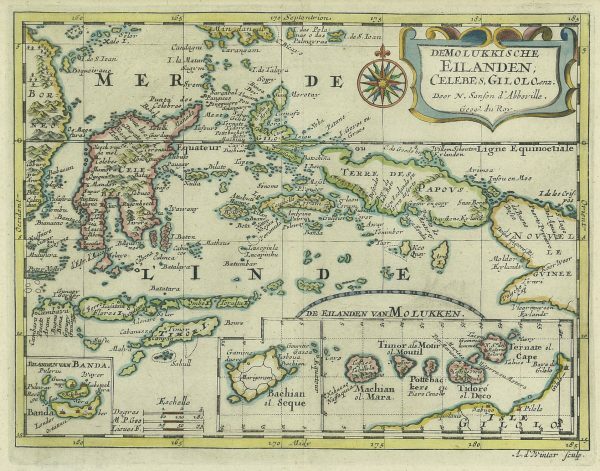 DE MOLUKKISCHE EILANDEN;CELEBES, GILOL. enz./Door N. Sanfon d’Abbeville./Geogr. du Roy. A rare late 17th century French map in attractive modern colour of the eastern islands of Indonesia and Papua-New Guinea including insets of the clove producing islands of the North Moluccas (Ternate, Tidore, Machian, Bachian and Potterbackers) and the nutmeg and mace producing Banda Islands of the South Moluccas. The map was engraved by Antoine de Winter, a Dutch engraver from Amsterdam and was published by the French cartographer Nicolas Sanson d’Abbeville (1600-1667) in a Dutch edition of his Pocket Atlas of Asia c. 1653. Sanson tutored his monarch, Louis XIII, in geography and was later presented with the brévét of Geographer-in Ordinary (Geographe Ordinaire du Roi), thus establishing the royal patronage for cartography and harnessing the services of the State to the production of maps. Measures 187 x 247 mm (Ref. Parry, 2005, p. 157, Plate 5.26).